In the northern U.S., snowy conditions and ice accumulation can be a frequent cause slip-and-fall accidents. 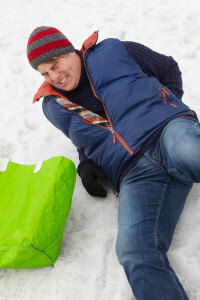 When you are injured in a slip-and-fall accident on snow or ice, you should contact a slip and fall lawyer because may have grounds to file a lawsuit in an attempt to recover compensation from the property owner or insurance company to cover your losses such as medical bills or lost wages. Property owners are legally responsible for maintaining their premises in a safe condition, which includes plowing, salting and shoveling sidewalks, parking lots and any other potentially dangerous areas where there is snow or ice present. Failure to do this can constitute negligence. When a property owner doesn’t meet this obligation, and someone is injured, the owner may be liable for damages. This means the owner may be open to a premises liability claim due to the personal injury that occurred on the property. If you or a family member have been injured in a snow or ice-related slip-and-fall, speak right away to an experienced Bronx ice and snow injury lawyer at the Law Offices of Thomas J. Lavin. You may be entitled to compensation for medical expenses, lost wages, and more. In New York City, property owners must clear accumulated snow and ice within a reasonable time – generally four hours – after a storm. When owners fail to remove accumulated snow and ice within a reasonable timeframe, they may be held liable for the injuries that result. Snow and ice-related injuries that commonly generate lawsuits include broken bones, concussions, and leg, knee, back, neck and even brain injuries. Just being injured, however, is not enough to win. A good Bronx ice and snowfall damage lawyer will have to demonstrate that the business, property owner or manager had, or should have had, knowledge that ice or snow had accumulated; that the owner or manager had the opportunity to remove the accumulation and failed; and that your injury was directly caused by that failure. Furthermore, your attorney will have to demonstrate that your injury caused economic damage (such as medical expenditures) or non-economic damage (such as pain and suffering). If necessary, our law firm will call on medical specialists and other accident experts as we work on your behalf. We will also attempt to secure surveillance and security footage to provide evidence of the conditions and lack of ice and snow removal efforts. An experienced Bronx ice and snow injury lawyer at the Law Offices of Thomas J. Lavin can assess the details of your case, determine the extent of your injuries, and provide the sound legal guidance you need. With more than thirty years of experience representing accident victims, we understand your concerns. Act now to protect yourself. Schedule a free consultation with an experienced Bronx premises liability and personal injury lawyer at the Law Offices of Thomas J. Lavin. We never charge a client until you receive compensation. Call us at 718-829-7400 or toll free at 800-394-4216, or complete the form on our Contact Page and make the first move to protect yourself today.